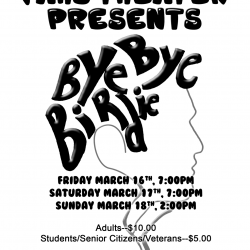 Fleetwood Area High School students are putting on a production of the musical Bye Bye Birdie this year. The musical follows the story of a famous rock and roll singer visiting a town called Sweet Apple, Ohio before he is drafted. The production will take place on the following dates March 15th 7:00 pm (Senior Citizen free performance – donations accepted), March 16th 7:00pm, March 17th 7:00pm, and March 18th 2:00pm. Ticket Prices: $5 (Students, Senior Citizens, Veterans) $10 (Adults).